Home millers have definite preferences when it comes to wheat. Many favor hard spring wheat over winter wheat for it’s somewhat higher protein value (and stronger gluten). Furthermore, some prefer the red variety for it’s robust flavor while others prefer the milder taste of white. Some Background: Hard Red Wheat vs Hard White WheatHard white wheat was developed from hard red wheat by eliminating the genes for bran color while preserving other desireable characteristics of red wheat. Depending on variety, red wheat has from one to three genes that give the bran its red cast; in contrast, white wheat has no major genes for bran color. The elimination of these genes results in fewer phenolic compounds and tannins in the bran, significantly reducing the bitter taste that some people experience in flour milled from red wheat. 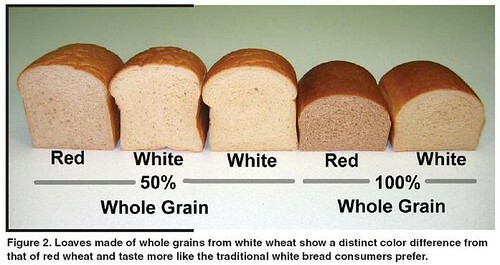 Nutritional composition is the same for red and white wheat. This photo shows hard red wheat on the left and hard white wheat on the right. I decided to do a two pronged test of home milled wheat flour: red vs. white wheat and winter vs. spring wheat. I used my tried-‘n-true recipe for a fifty percent whole wheat loaf bread. I made the bread four times – twice with home-milled hard red winter wheat and twice with home-milled hard white spring wheat. The baker’s percentage was the same for all trials, as were the other ingredients and the procedure followed. Doesn’t look much different on the outside, does it? Before I started this test, I’d never worked with hard white wheat. While others frequently comment on it’s mild taste, I wasn’t prepared for a fifty percent whole grain bread that tasted like – ummmm – white bread! OK, not exactly like white bread, maybe an eensy bit denser and an eensy bit more taste but close enough to make me question the wisdom of purchasing 25 pounds of hard white spring wheat. A lot of posters here use only whole grain flour, mixing white and red wheats to get the flavor profile they prefer. When they describe white whole grain as mild, you’d better believe it. From The Fresh Loaf, an online news and information source for amateur bakers and artisan bread enthusiasts.